I just had a great conversation with Dana Carroll and Mark DeWitt about ways one might improve homology-directed repair. But the proof will be in the pudding. I'm sure many (many, many, many) groups are working to crack this particular nut, but so far it's been recalcitrant. Cells just love to use NHEJ instead of HDR, which is great for making knockouts but not so good for true editing. 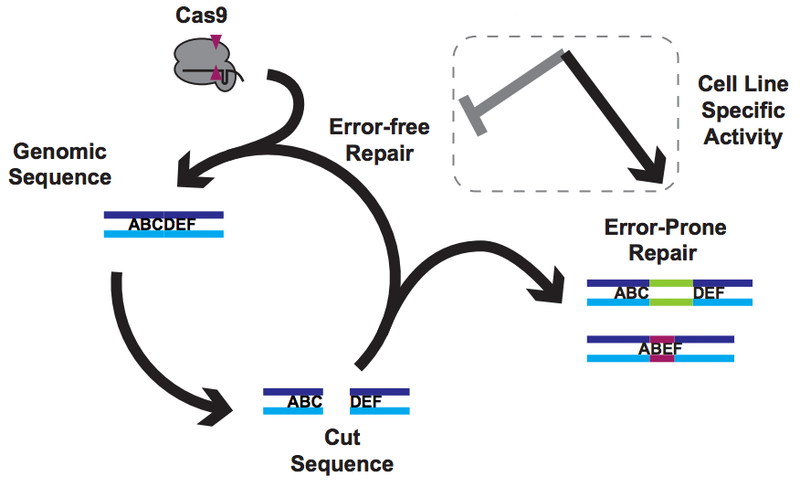 The Cas9 mouse is a great proof-of-concept tool that brings mouse genetics to the people and I think will both accelerate research and decrease frustration. Cutting in the brain looks outstanding, and making knockouts in primary immune cells was a great idea. Editing in the lung looks a bit more iffy, and from Figure 1 it's not clear to me whether the problem is AAV delivery of sgRNA or Cas9 expression (highest in brain but relatively low in lung). Regardless, getting simultaneous knockout of two genes and editing of another is quite a feat! But the very mosaic nature of the mutations will probably restrict this to making changes that lead to hyperproliferation, such as loss-of-function tumor suppressors or gain-of-function oncogenes. Though I wouldn't bank the farm on results from knockouts in Cas9 mice alone, one potential utility is proof-of-concept to trigger a traditional transgenic animal. It's not uncommon to spend the huge time and effort involved in making a transgenic mouse but find no phenotype. With the Cas9 mouse, one could test several candidates for phenotype and then make the clean transgenic (including backcrosses) in promising-looking cases. And with more efficient editing (coming in v2? ), this might truly be a game-changer. At the risk of becoming structure-centric (three crystal structures in four posts), I couldn't pass up commenting on the Jinek Lab's beautiful structure of SpyCas9 in complex with sgRNA and target DNA including an NGG PAM. One big take-home here is that the PAM is read out by two arginines (1333 and 1335) and a lysine (1107). The PAM itself is hybridized to the non-target DNA strand, but the DNA immediately downstream is flipped 180 degrees so that it can be read out by the RNA protospacer! This bit of structural juggling is made possible by a serine, which together with a backbone contact forms an interaction the authors term a "phosphate lock". Like any great science this paper raises as many questions as it answers. Mutating the PAM-contacting arginines to alanine abolishes DNA binding, but switching them to the identities found in organisms with non-NGG PAMs doesn't switch PAM specificity. So is it even possible to make SpyCas9 recognize other PAMs? You can bet that many groups are working on that very problem, and I'm sure this paper has given them some ideas. Following up on last week's post on structures of the E. coli Cascade complex, I just realized that I missed Blake Wiedenheft's structure in Science. Blake determined the original Cascade cryoEM envelope (at 8Å no less! ), so it's quite nice that his group also solved one of these beautiful crystal structures. It's funny how high-impact structures sometimes come in waves. There seem to be many examples in the literature of long-awaited structures suddenly being cracked by multiple groups simultaneously. Is it game-changing technical advances, new biological insight, or just synchronicity bias? This week saw not one, but two papers with structures of the E. coli Cascade complex from the labs of Yanli Wang (Nature) and Scott Bailey (Science). Cascade is a bit like Cas9, in that it's a bacterial immunity endonuclease targeted via CRISPR nucleic acid, but far more complex. While Cas9 is a single protein (and hence attractive for genome engineering), Cascade is 405 kDa split over 11 separate polypeptides and 5 open reading frames. In both structures, the crRNA is stretched out across the entire complex. The structure from Bailey's group also has ssDNA bound, and while it generally follows the path of the crRNA, kinking and base flipping allows the pairing to severely underwind into a ribbon. As is often the case in a large, complex structure like this, there are all kinds of exciting bits to poke into and look at to explain existing biochemical data. I'm looking forward to carefully reading both papers and playing with the structures when they're released. Kudos to both groups! On a side note, these are huge ~ 3 A structures that also contain nucleic acid, yet both are refined to levels that would have been unthinkable just a few years ago: R/Rfrees of 22.5/29.9 and 20.7/16.4! Of course there's more to structure quality (and a structure) than the R-stats. But still, it's astounding.